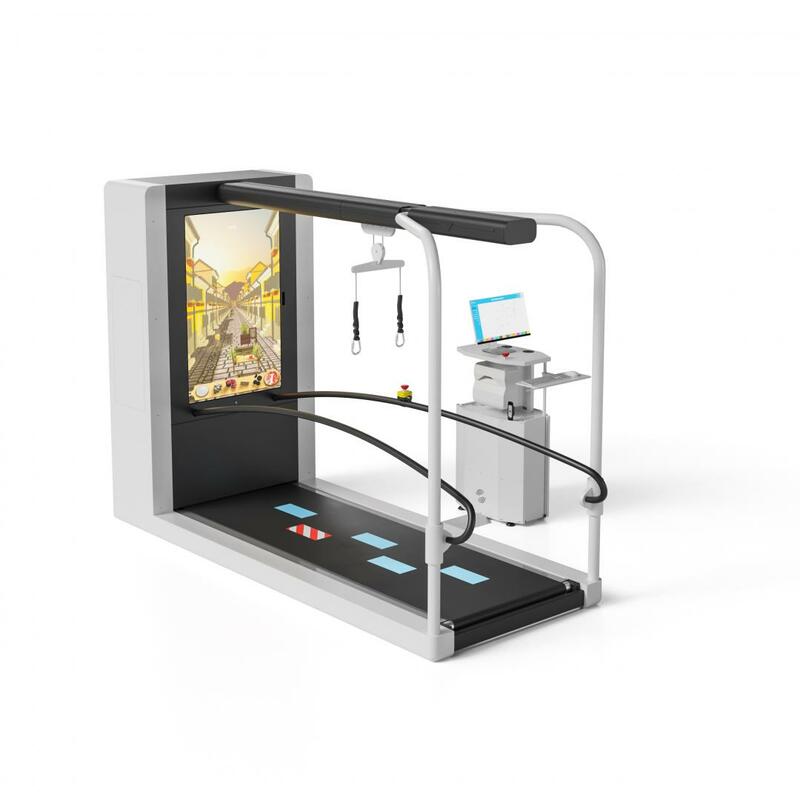 The C-Mill is an augmented reality (AR) and virtual reality (VR) instrumented single belt treadmill, used for the evaluation and training of impaired gait and balance. 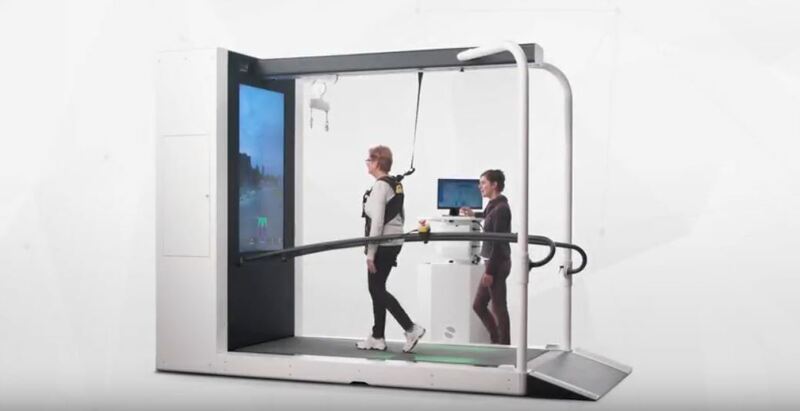 A complete, advanced gait lab and training centre on 4m squared, the C-Mill allows for gait adaptability strategies through obstacle avoidance in a safe and controlled environment. We have been pleased to work with the C-Mill for a number of years with our partner Motek. 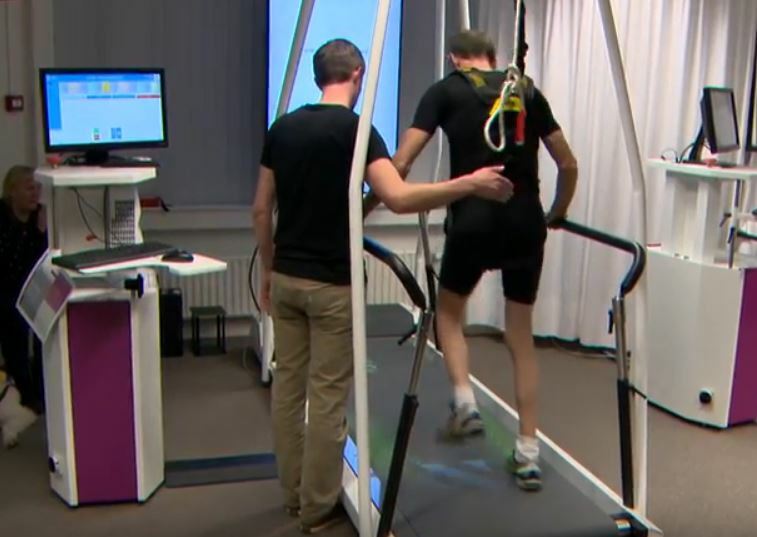 Now distributed now by Hocoma, the treadmill uses visual and acoustic cues projected onto the belt surface and displayed on the front screen, as well as game elements, to provide motivation and challenges for patients as they recover their stability and gait. The C-Mill treadmill is ideal for patients requiring rehabilitation for neurological conditions, brain and spinal injuries, stroke, Parkinson’s Disease, movement disorders, amputees, cerebral palsy, stability training, and fall prevention. 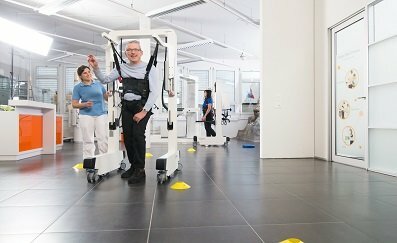 A fully-integrated body weight support system is available as an optional extra, for any patients who are unable to stand or walk by themselves or require help to stand up out of their wheelchair. 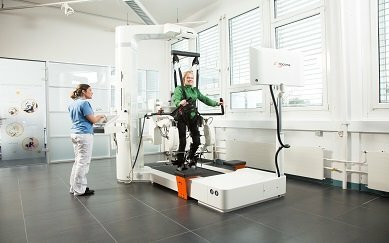 It is possible to significantly reduce the patient’s body weight during their gait and balance training, so they can start therapy much earlier in the rehabilitation process. A ramp can also be provided so wheelchair patients can access the C-Mill and its body weight support system. Download the C-Mill brochure here. Therapists can make adjustments tailored to each patient, set challenges, monitor the immediate effects, and generate reports, all with just a few clicks. The patient’s performance can be measured and saved to provide short and long-term progress reports, allowing the therapist to tailor each session according to the patient and their progress. Parameters such as step length, width, frequency and symmetry are automatically recorded and analysed via the force plate within the treadmill, so there’s no need to attach markers or wires to the patient. The C-Mill’s extensive data collection, thanks to the force plate, allows for valid, objective and reliable assessment of gait, balance and adaptability. 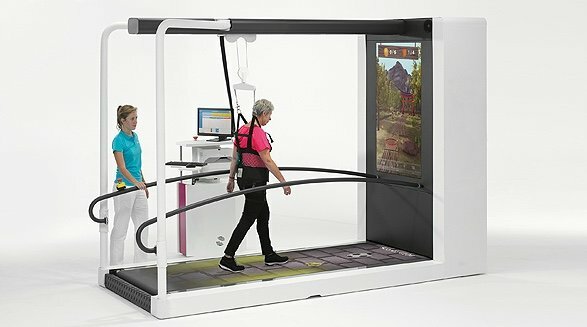 The C-Mill can be used for balance (static postural control and dynamic weight shifting in four directions); for gait (spatio-temporal parameters and the patient’s centre of pressure); and for gait adaptability (using the treadmill’s projection and VR applications to simulate real-life situations). 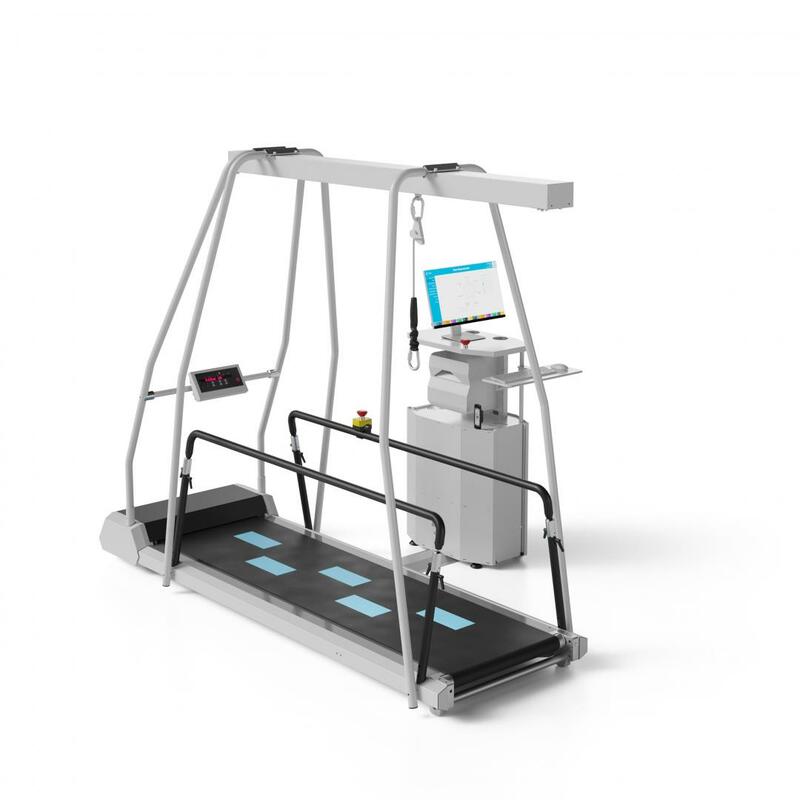 This is the basic C-Mill model, featuring an instrumented treadmill, augmented reality projections on the treadmill belt, a safety harness, handrails, and a full suite of gait and balance applications. 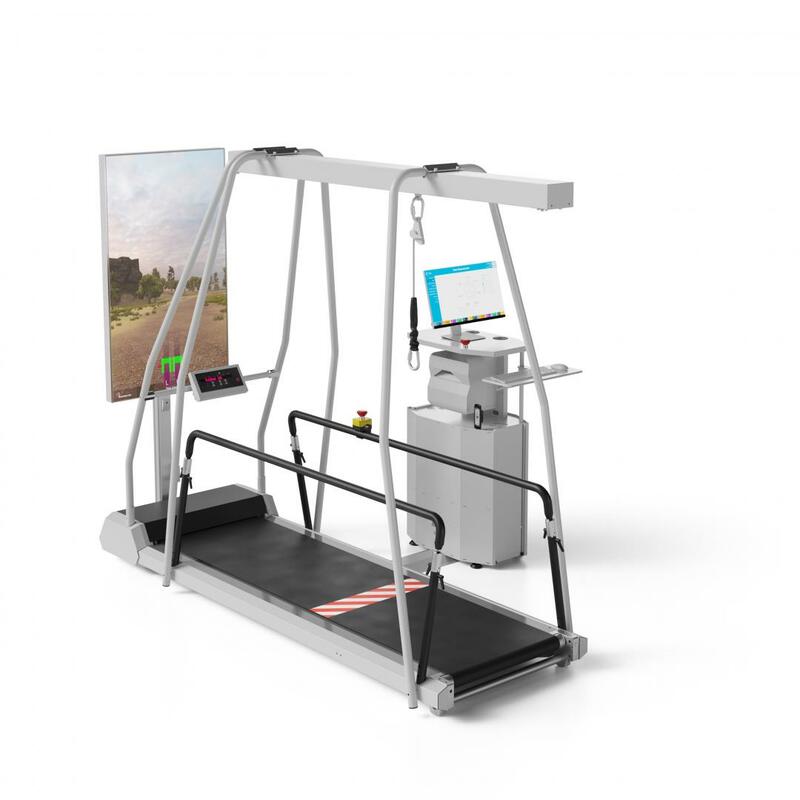 This C-Mill model features an instrumented treadmill, augmented reality projections on the treadmill belt, a virtual reality screen, a safety harness, handrails, and a full suite of gait and balance applications. 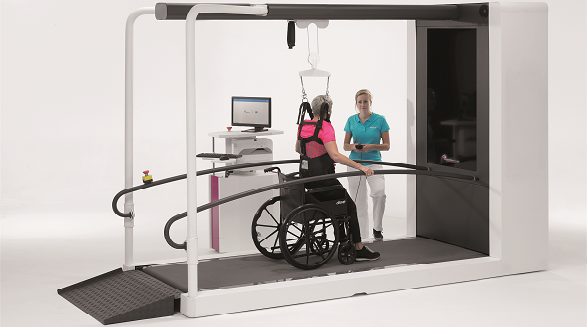 This advanced C-Mill features an instrumented treadmill, augmented reality projections on the treadmill belt, an inset virtual reality screen, a safety harness and built-in body weight support system, handrails, and a full suite of gait and balance applications. 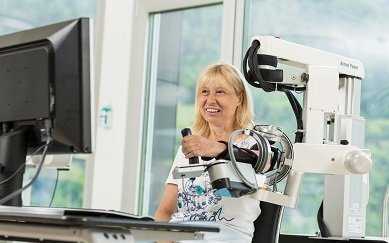 If you would like to try the C-Mill VR with your own patients, we offer a 3 month clinical trial where we install the equipment at your facilities and give your staff full training. “A 54-year-old patient had a left-sided stroke in September 2016. After 10 sessions using Virtual Reality (VR), including the C-Mill, she stated she was more confident in her walking and her balance skills had improved. This means she felt safer when walking around, both indoors and outdoors. A 52-year-old patient suffered a right-sided weakness following a stroke in April 2017. He had 10 sessions using Virtual Reality, including the C-Mill. He states that his confidence has grown and he feels safe walking short distances, and he is now able to manage the stairs. “We have a standard treadmill in our outpatient gym but felt that the C-Mill would offer a more interactive therapy experience and enhanced treadmill training. We have had the treadmill on loan for 3 months and have used it with a wide variety of patients aged from 4 -15. We have used it for post-operative orthopaedic and neurological diagnoses including Cerebral palsy-following SDR surgery, post-op limb lengthening and brain injury rehabilitation. The stepping stones function has been excellent for promoting improvements in stride length and the children have particularly enjoyed the animal games that promote sideways movement and stepping over objects. It is unusual to have a treadmill that you can move around on and it provides a much more functional environment to work on gait training. We have found that we have been able to do longer sessions than on a standard treadmill as interest is more easily sustained. Where can I find the C-Mill? 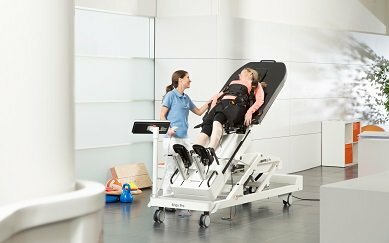 We’re proud to include UK clinics such as the Morrello Clinic in Newport, South Wales, and The Brain and Spinal Injury Centre (BASIC) in Salford, Manchester, as users of the C-Mill. Read the Morrello Clinic’s research report and case studies here. 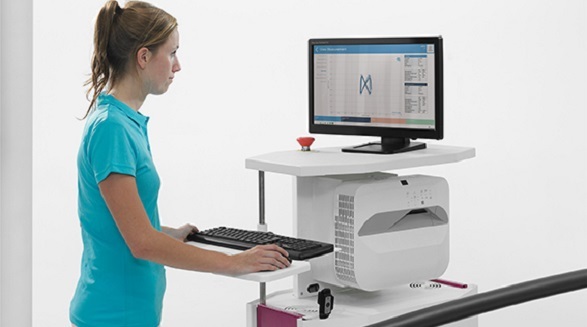 Want to try out a C-Mill treadmill with your own patients? We are pleased to be able to offer the C-Mill on a 3-month clinical trial basis. This includes installing the C-Mill in your clinic for a small fee and giving your staff full training so your patients can feel the benefits themselves. After 3 months, you can either purchase a C-Mill or return it to us. It’s as simple as that. 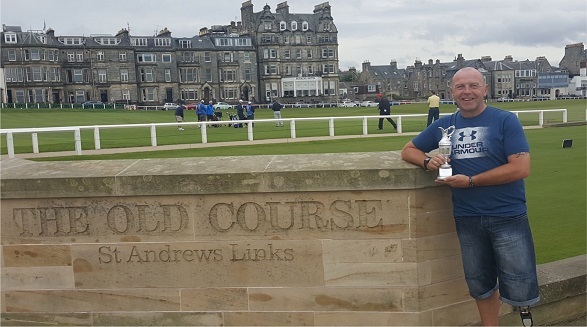 C-Mill user at The Morrello Clinic, currently number 2 in the European Disabled Golf Association, and 6-time winner on the EDGA tour.